This is not your typical refrigerator or memory ribbon magnetic; this is extra durable 30 mil Durabond TM magnetic vinyl sheeting. The US MAIL SIGNS are screen printed using the best quality out door inks for the longest lasting outdoor life possible. United States Mail Rural Route Drivers need to warn other drivers of the potential for frequent stops. This style magnetic U.S. MAIL signs are available in 15" x 5" and 21" x 7" sizes. All signs have rounded corners to promote durability with frequent removal from the vehicle. QUANTITY PRICING, WHEN YOU PURCHASE MORE THE PRICE PER MAGNETIC GOES DOWN. 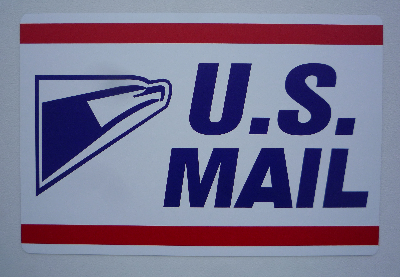 This style magnetic U.S. MAIL signs are available in 8" x 4", 12" x 6" and 16" x 8" sizes. All signs have rounded corners to promote durability with frequent removal from the vehicle. This style magnetic U.S. MAIL sign is 18" x 12" with rounded corners to promote durability with frequent removal from the vehicle. Primary use for this magnetic is as a protector for your vehicle door. Save your vehicle from the repetitive damage sustained from opening mail boxes.